Petrochemical – New Innovations | Quantiam Technologies Inc.
Our Petrochemical-Chemical coatings innovation pipeline targets continuous improvements and addresses progressively more severe operating environments. The infographic summarizes current and future benefits of our Petrochemical solutions portfolio. 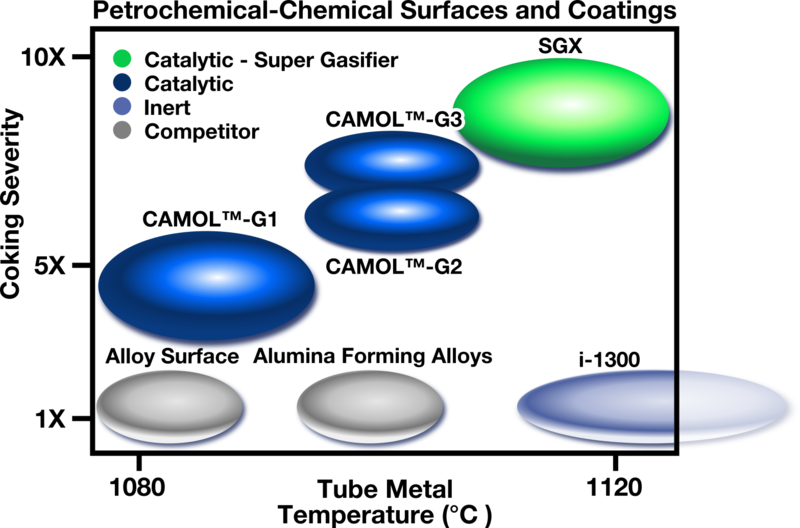 Our CAMOL™ products enable producers to achieve increased production uptime and run at higher severity (greater propensity to coke) than the furnace high temperature alloy (‘alloy surface’) and previous generation technologies which form an unreactive, protective coating on the furnace tube inner surface, denoted as (‘Alumina Forming Alloys’). Quantiam’s next-generation products, SGX and i-1300, will push the operating envelopes of olefin production furnaces even further, allowing for greater profitability and reduced GHG emissions in higher severity furnaces. SGX and i-1300 will allow olefins producers to mitigate increased coking rates and take advantage of new shale gas economics, with a novel “Super-Gasification” platform which provides both anti-coking and energy-and-emissions reductions for high severity ethylene production conditions. SGX’s advanced catalysts will enable gasification capability into high operating regimes by eliminating the dependence on steam dilution as a source of oxygen for gasification. SGX is complemented with the low cost i-1300 coating for regions where catalyzed carbon gasification is not possible or warranted. 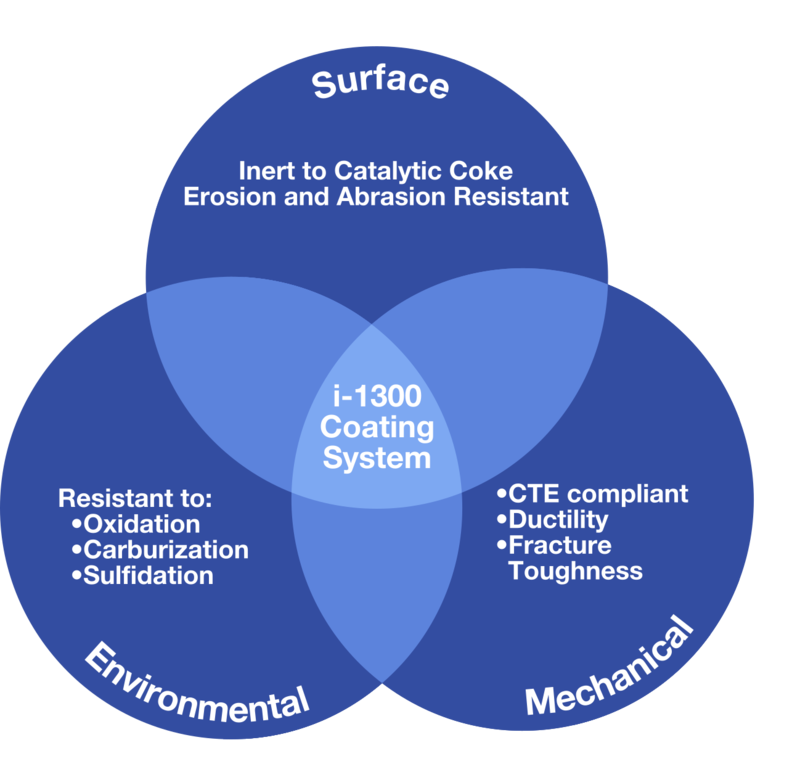 The i-1300 Coating System has combined environmental, mechanical and surface properties to produce a high temperature thermally stable inert coating. SGX and i-1300 technologies target estimated payback period of less than 1 year. SGX targets a reduction in energy consumption and emissions of 10-14% within the radiant section. ~17 KT/CO2E PER CRACKER UNIT, WITH AN ESTIMATED CUMULATIVE GLOBAL GREENHOUSE GAS (GHG) REDUCTION OF OVER 2.2 MILLION TONNES OF AVOIDED CARBON DIOXIDE EMISSIONS (CO2E) BY 2030, FOLLOWING MARKET ROLLOUT. furnace regions of severe tube metal temperatures, internal and/or external. The coating system is being engineered to be placed in (a) cooler areas of the furnace; and (b) temperature problematic areas to survive temperatures >1,200°C with short durations up to 1,300°C as an internal surface temperature WITHOUT any loss of inertness to filamentous (catalytic) coke make. In parallel to our advanced SGX and i-1300 new coated products under development, Quantiam is pursuing opportunities to enhance the heat transfer capabilities of tubulars through advanced coatings of both the internal and external tube surfaces. Development of high heat transfer tube technologies target further reductions in energy requirements per unit of ethylene produced with a corresponding reduction in GHG and NOx. These two heat-transfer tube technologies have a potential of doubling the SGX/i-1300 energy and GHG emissions reductions targets of 10% to 14% as well as increase the overall throughput by up to 10% (everything else being equal). These HHTT coatings and profiles target to reach TRL7 in 2020/2021. Generally, coated tubes and fittings that have been advanced to commercial availability for cracking furnace coils leave post-coating welds uncoated with coking and degradation appropriate to such. The uncoated tube length due to such uncoated welds ranges from a minimum of 0.5 inches and can reach up to 1.0 inches (25-50mm) per weld. In Medium severity cracking, uncoated welds have not been found to be overly limiting on performance observed, especially in larger diameter tubes, however in the higher severities targeted by SGX and i-1300, Quantiam is advancing to provide some weld surface performance protection above that available in the uncoated condition. The technologies are advancing for use with both orbital welds and electron-beam welding and target to reach TRL7 in 2020/2021.